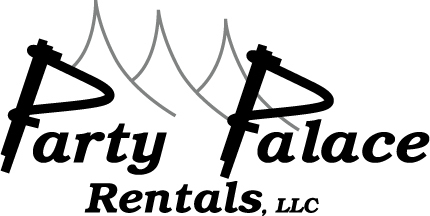 Party and Tent Rental in Baltimore, MD | Party Palace Rentals, LLC. Tent Rentals for All Occasions in Maryland, DC, and surrounding states. At Party Palace Rentals, LLC, we care about making your upcoming event a thing of beauty. Our truly gorgeous party tent rentals in Baltimore, Forest Hill, MD, and the surrounding areas, and equipment rental for outdoor events in Baltimore, MD will add that bit of flair you have been looking for. Attractive and easy to maintain, this one-piece top is made of 16 to 18oz mildew resistant and flame retardant vinyl laminated fabrics. Simply put, Fiesta tents are easier to handle, better looking, longer lasting, and have superior quality for a terrific value. The Fiesta is elegant, versatile, transparent, and open air. It is unobstructed by interior center poles, meaning more room for seating, dancing, relaxation, and enjoyment. This expandable tent can even make a small inventory suddenly larger! Turn a 16' x 16' Fiesta into a 16' x 32' in mere minutes. Fiesta Frame expandable tents from Anchor allow you to customize any event using the frame components, and make a great wedding party tent. Connect tented events together and shelter walkways, entries, and exits from the elements. The Fiesta Marquee comes in two styles. The traditional model can stand alone, while the L-shaped marquee can be placed any way you wish and is perfect for corners. Anchor has the Fiesta Marquee ready to join all of your parties. The Century Frame tent features durable, aluminum beam frames and attractive one-piece tops. The new, easy-sliding sidewall system makes wall installation a snap and keeps tent walls clean and beautiful. Watertight guttering also joins units together for larger accommodations. 20' and 30' units convert to 10' and 15' sizes with simple frame adjustments and top changes. This tent is excellent for weddings, parties, and outdoor events. 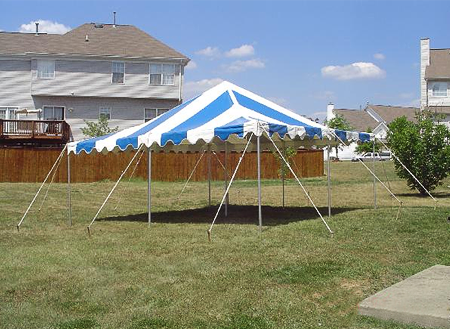 When ordering rental tents from Party Palace Rentals, LLC, in Forest Hill, Maryland, making sure you have the right size is important. To ensure you have enough room for your gathering, we offer many different sizes to suit your needs. 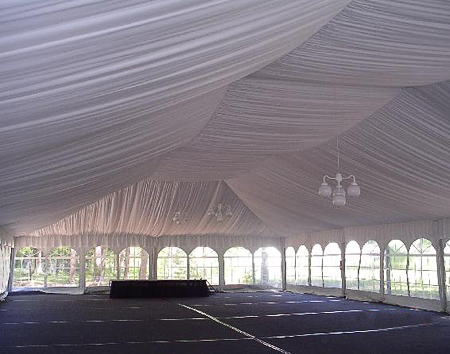 This spacious tent will accommodate approximately 40 to 50 guests. A five-table setup is ideal for this model. Globe lights can also be strung around the perimeter of the tent to provide excellent and beautiful lighting for your party. This tent is limited to the number of tables that can be set-up to accommodate your guests. Since two poles are needed to support the canopy, this tent can hold 48 people comfortably. This model can accommodate 32 to 35 guests. However, with the center canopy supports, it is difficult to add additional seating for people. Attractive globe lighting can also be added to this tent, providing light and beauty that's ideal for any gathering. This attractive option is ideal for those planning a wedding and needs to accommodate 300 to 320 guests. The large area also allows for additional items such as a dance floor, staging, and buffet tables. Sidewalls can be added to any tent for a variety of applications. These walls are used for privacy to enclose the atmosphere, creating a more intimate space. In addition, they are used for weather conditions that are not acceptable for your party. Heating and air conditioning can be provided but does require sidewalls to be installed. After you make your outdoor tent selection from Party Palace Rentals, LLC, we will discuss your delivery options. Customers in Forest Hill, Maryland, and the surrounding areas can expect on time delivery and setup performed with a smile. Equipment set-up is also available. Rate charges apply to the amount of equipment assembled. Please contact us regarding any issues that occur during setup or delivery. Prices are based on flat level areas, such as grassy surfaces with no obstructions. An additional charge may be incurred for setup areas that are restricted to abnormal surfaces, limited access, and overhead or side-view obstructions. During inclement weather when the tent is used, experienced tent personnel should be on hand to ensure the security of the equipment and those using it. All parties must be aware of the limitations for safe occupancy. The tent renter must retain the right to declare the area unsafe for occupancy. Please always follow the manufacturer's instructions and warnings. 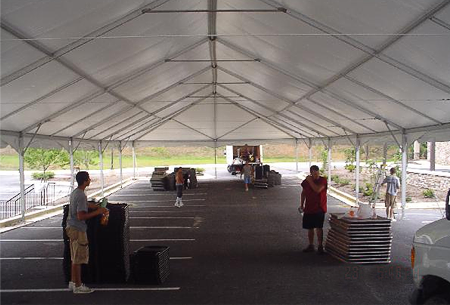 Our services for installing tents are for one location only. Once the site is determined, we do not move the tents for any reason. If this happens, there is a labor charge to relocate the tents.